UT Idea Lab | Idea Storm IV facilitators and topics! Idea Storm IV facilitators and topics! Here are all the facilitators and topics of Idea Storm IV! 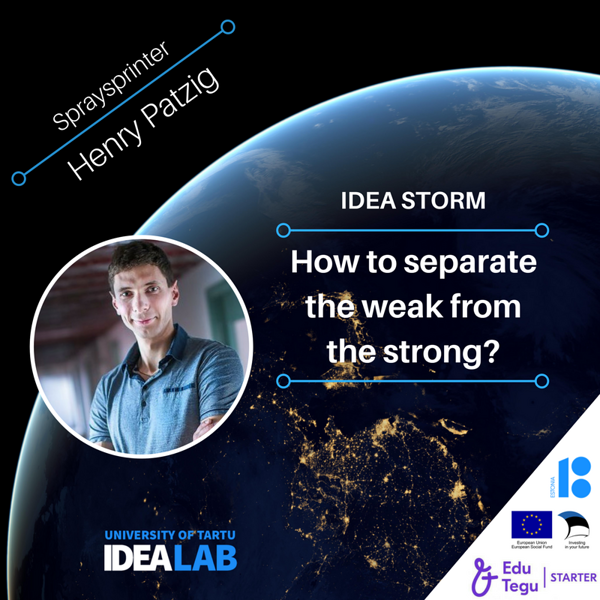 Idea Storm is an inspirational event that brings together more than 20 entrepreneurs and 200 students to have discussions on different topics. At the event, everyone will choose one topic they are most interested in and will sit at the table with the field expert. The aim of the discussion is to come up with new ideas and solutions related to the problem statement. At the end, each table will present their most innovative idea. How to make remote work more efficient than working in the office? 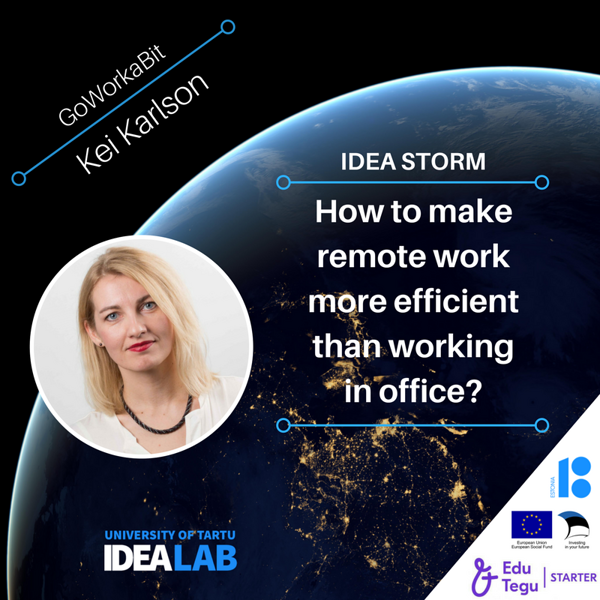 Kei Karlson is the co-founder of GoWorkaBit – the platform to help companies with an urgent need for temporary staff. Kei has been doing HR work for over 10 years. She has been the HR specialist for Playtech and the personnel consultant for Manpower Estonia. She is one of the main drivers behind GoWorkaBit where she has recruited, marketed and excelled in sales. How should the industry be digitalized? Aleksander Gansen is the co-founder of Shipitwise and is in charge of strategic sales. Shipitwise provides software to automate logistics. Also, he is the co-founder of Palazzo Sisustussalong, 14-years-old Estonian interior design brand. 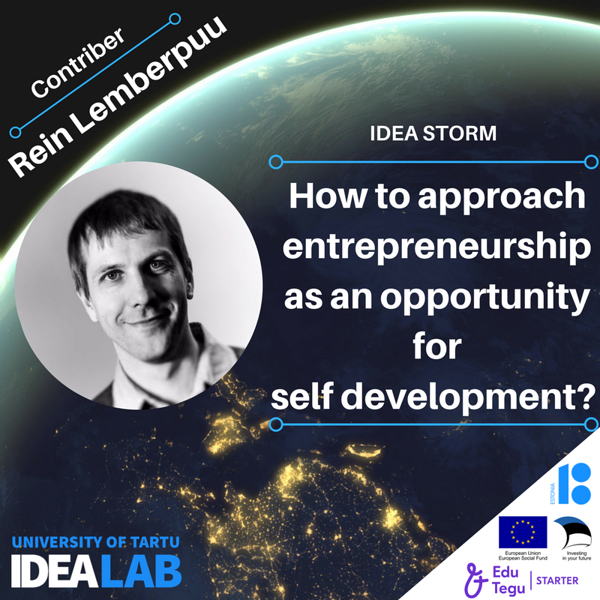 He is an alumnus of the University of Tartu and has been an entrepreneur for over 25 years. How to support learners creativity and innovation? Juko-Mart Kõlar is a co-founder of Fanvestory, a startup that allows music fans to invest in songs and earn long-term profits with the artists. He also works as an Advisor on Music at the Estonian Ministry of Culture. He is a consultant, mentor and lecturer of various courses related to creative industries. Juko-Mart Kõlar has graduated from Sibelius Academy Arts Management Master’s Degree Programme (Finland) and worked on his doctoral thesis at the University of Sorbonne. How do we pack goods in the future? 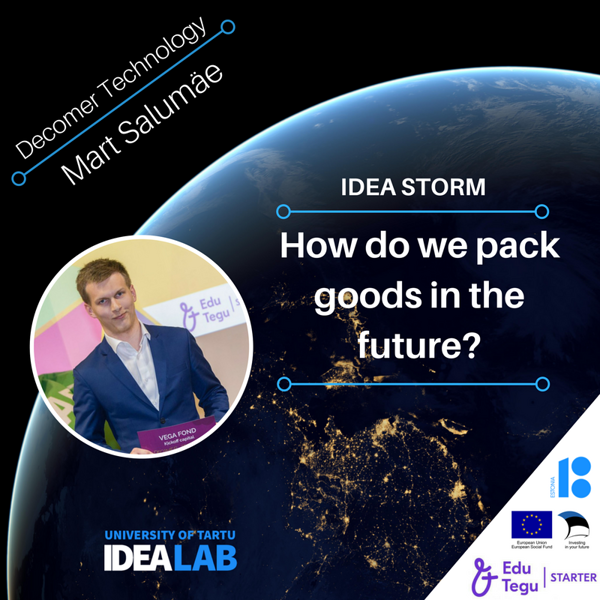 Mart Salumäe is the co-founder of Decomer Technology- a startup which develops bioplastics, which are used to package honey for a replacement to sugar. He acquired his master's degree in materials science at the University of Tartu. Mart also excels in pitching, whereas during sTARTUp Day he was able to win one contest after another to eventually show his great idea on the main stage to everyone. 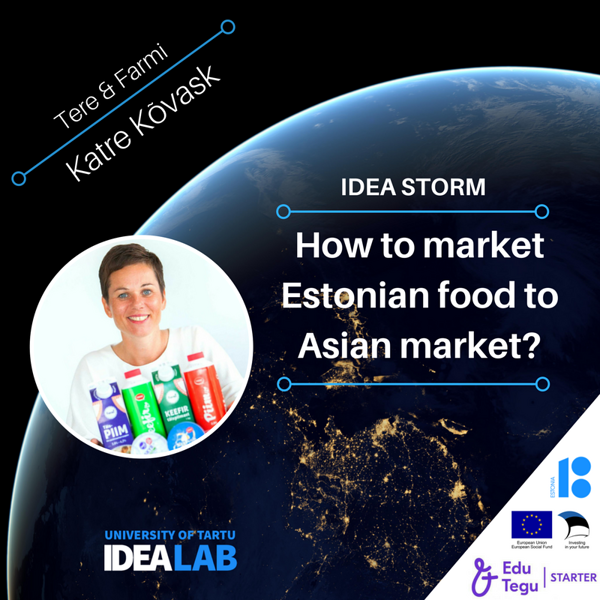 How to market Estonian food to Asian market? Katre Kõvask is the CEO of Estonia's leading dairy- Farmi Piimatööstuse AS and Tere AS which deals with production and sales of high-quality, branded fresh and commodity dairy products. She has been working for both local and international leading food industry players previously for 16 years, starting as a marketing manager and later on holding various CEO-positions. During her studies at the University of Tartu, she specialized in marketing & foreign trade. How would a world look like if artificial intelligence would do all the work? 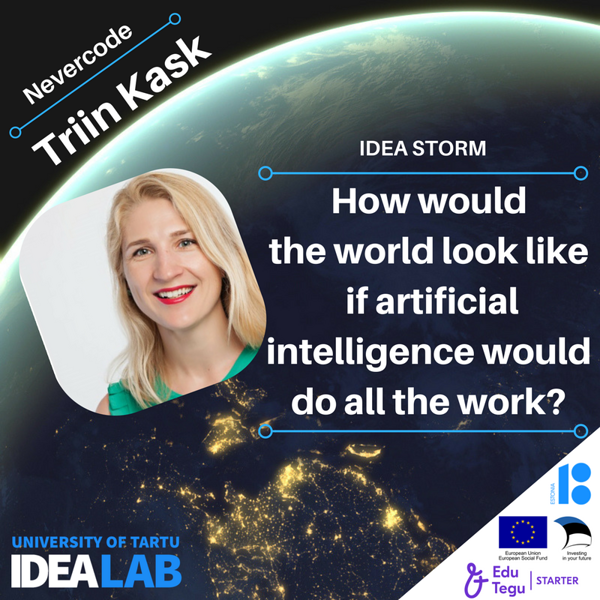 Triin Kask is the co-founder and CEO of Nevercode- a startup which helps mobile app developers build better apps faster. She has acquired her master's degree in economics at the University of Tartu and is currently in the middle of acquiring her doctoral degree. Also, she is a trainer at Sense Trainings, where her main subjects are entrepreneurship, self-motivation and conflict management. How to turn Tartu into dream city? 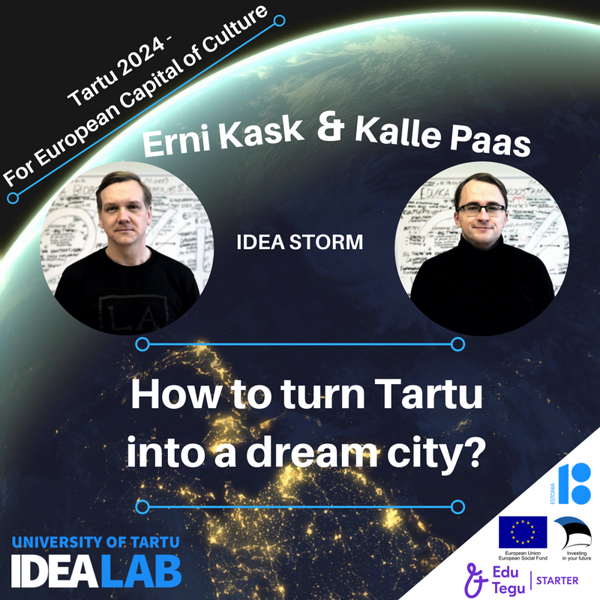 The table will be lead by Erni Kask and Kalle Paas who are the core team of Tartu 2024 - for European Capital of Culture! ECoC is one of the most recognized and treasured EU projects that started already in 1985. Through culture and art, Tartu as an ECoC improves the quality of life and strengthens its sense of community. Tartu and the local governments of South Estonia are working closely together to ensure that Tartu becomes the 2024 European Capital of Culture. How to cope with cultural differences? Sven is the author of the idea and methodology of Brandlyse. He has a BSc in Philosophy (and social-pedagogy) and currently is acquiring a master's degree in Semiotics and Cultural Theory at the UT. He has won the first place in one of the biggest Estonian scientific writing competition and has a wide knowledge of semiotics and cultural studies. And also is an IdeaLab alumnus and has won 2016 with Brandlyse team Vega Foundation science-based start-up grant. 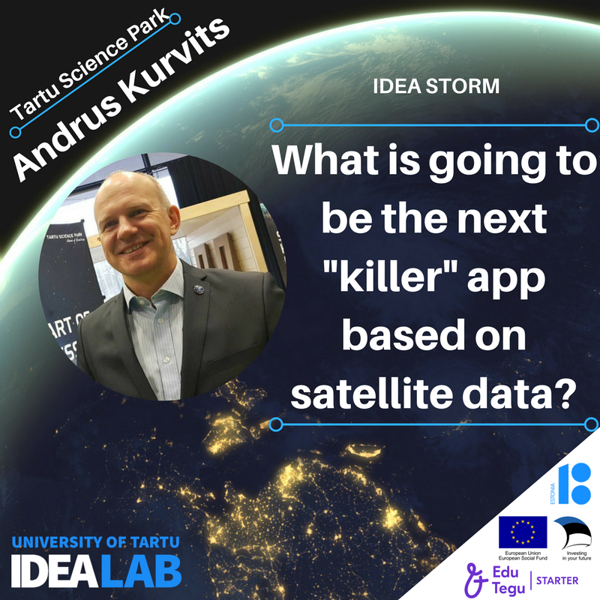 What is going to be the next "killer" app based on satellite data? Andrus Kurvits is a man with at least seven professions: he is the manager of ESA BIC Estonia which is the 17th ESA Business Incubation Centre in Europe and the first one in the Baltic States. 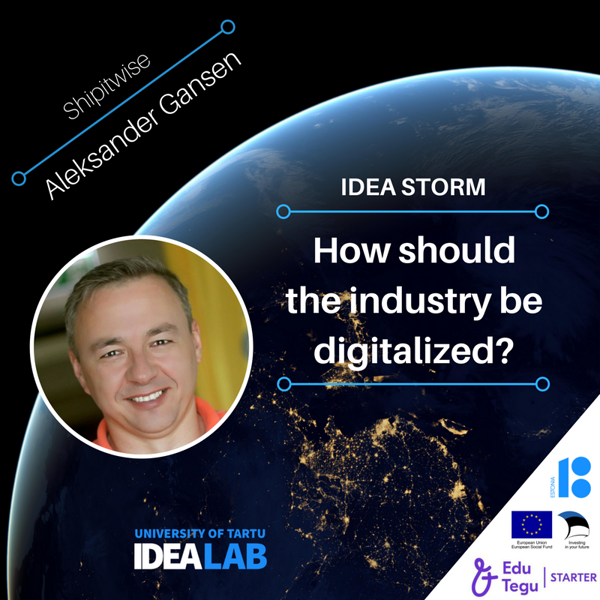 He is a board member of Tartu Science Park and a co-founder at Dilesy. He was also one of the key persons who made the grandiose business festival sTARTUp Day happen! How to approach entrepreneurship as a self-development? Rein Lemberpuu is the CEO of Contriber, which supports NewNordic founders by running sTARTUp Hub, SPARK Hub, co-organizing events from monthly meetups to sTARTUp Day and invests as an active early-stage business angel. Also, he was the CEO of Playtech Estonia for 5 years. How to create an app that doesn't feed on human weakness? Jaana has been working in product development around 10 years working as a product manager in fintech (Fortumo), travel (Kaligo) and now working with sales products at Pipedrive. She's inspired by products that enable people to be more and level up. How to prepare for robot invasion? Mihkel Tedremaa is Head of Product Technology at Ericsson Eesti and co-inventor of a TempID smart patch. TempID will enable temperature monitoring so that information could be gathered and visualized by mobile application! TempID and their team won business ideas competition Ajujaht in 2017! Mihkel knows a lot about mechatronics! What are the unexplored opportunities of sharing economy? Sven Illing is a business developer, adviser and investor. He has contributed to founding two startup accelerators - GameFounders and Buildit - and invested into 60 startups from all around the world. Sven has been interested in online marketplaces, including sharing economy, for a long time and as an early-stage investor, he'd like to see more ideas from Estonia connected to that fast-growing field. How sharing economy shapes the future of reading? Ojari Paas is a co-founder of Bookworld, which is an app for sharing books and reading recommendations. He has been an entrepreneur for 20 years in transport/logistics and technology/software development. Also, he was JCI president in 2012. 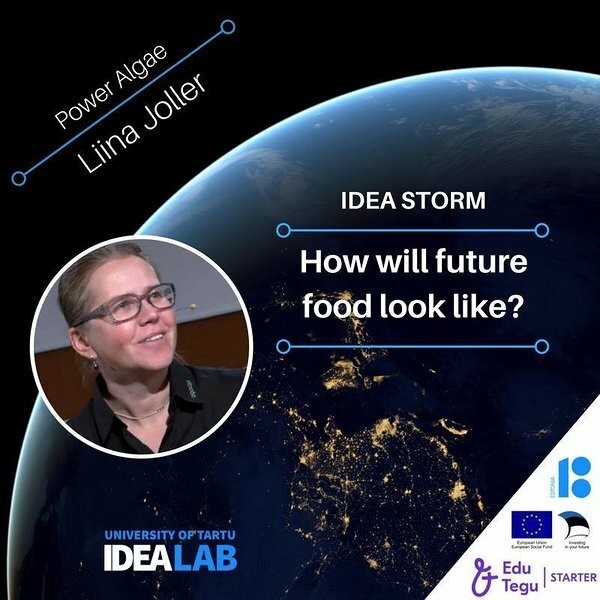 How will future food look like? Liina Joller is the co-founder of two start-ups: Power Algae and Algacap, both aimed at valorizing microalgae. She has a background in technology management and management consulting, and currently, she is finalizing her doctoral dissertation on the diffusion of innovative business models. Liina is also the co-founder of the eco-innovation group at the University of Tartu, and for many years has been an active member of JCI. How technology and media will save the environment? 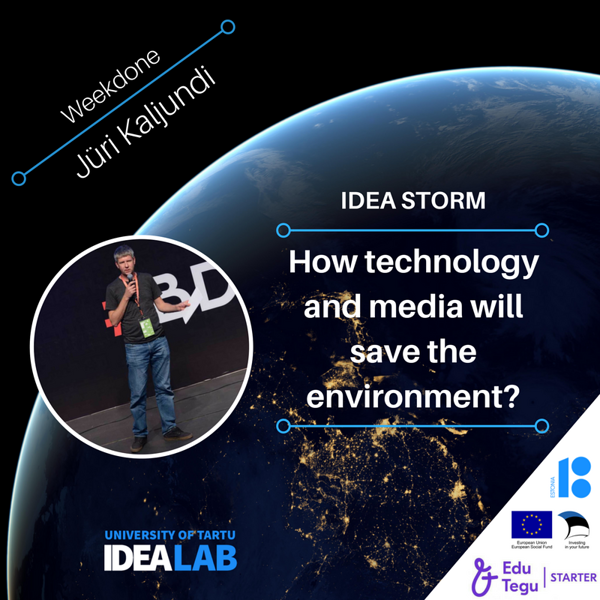 Jüri Kaljundi is the co-founder and head of product of Weekdone – a tool for team management, weekly reporting and internal communication. He's the founder of Garage48, the leading regional startup foundation and has held board positions in numerous enterprises like GrabCAD, VitalFields and Sportlyzer. How to separate the weak from the strong? Henry Patzig is design engineer at SprayPrinter! He knows a lot about product development and engineering. SprayPrinter is developing and providing service with wall climbing mural printer, that can quickly and cost-efficiently cover large walls. In 2016 SprayPrinter won business ideas competition Ajujaht! How should we cope with information overload in organization? Astrid Maldre is working at Elisa as start-up team and trainee program lead. She has an MBA from TUT and extensive experience in retail and she wants to offer products and services that clients will need tomorrow, not yesterday. Her team was created to find opportunities for Elisa that makes their clients' everyday life easier. How will we make transactions in the future? Kristian Sägi belongs to the group called Estonian Business Angels Network. He is the co-founder and CTO of Nevercode - a startup which helps mobile app developers build better apps faster. He also is a key coach at Tallinn Science Park Tehnopol. Kristian has exceptional project management experience from over 10 years of working for Playtech as project leader and mobile R&D manager. How will Internet of things improve the life? 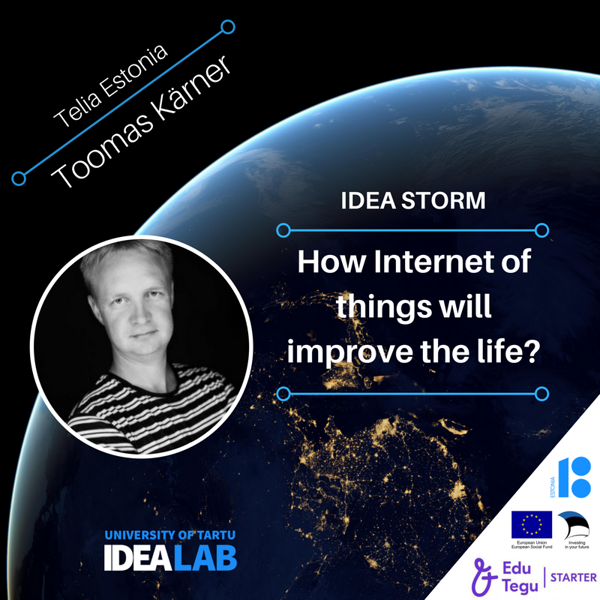 Toomas Kärner is working in Telia as the Internet of business manager. He has IT and IT management education and longtime work experience in the telecommunication business. He knows what the future looks like after everything is digitalized. How technology shapes fashion industry? Seren Eilmann has seen the business battle frontier from both sides - as the manager of a business incubator as well as being the co-founder of Heelosophy - a fashion tech company making seamless custom-made supports that are a perfect fit for every foot and every shoe. She is currently running a programme for designers and artisans called Buildit Creative. Being a business management professional with 14 years of experience in innovation and technology management, she loves to chat about technology, brilliant design, and daring ideas. How will personalized medicine help us in the future? Kerti Alev grew up in the generation with computer-sciences just emerging. After her first college degree, she combined both of her hobbies - computers, and design and became a multimedia designer and entrepreneur. Digitar Interactive OÜ is a multimedia solutions company and MediKeep OÜ is developing mHealth app for better longevity. Kerti has two kids and is doing MSc currently in Health Care Technologies. Which one is your favorite topic? 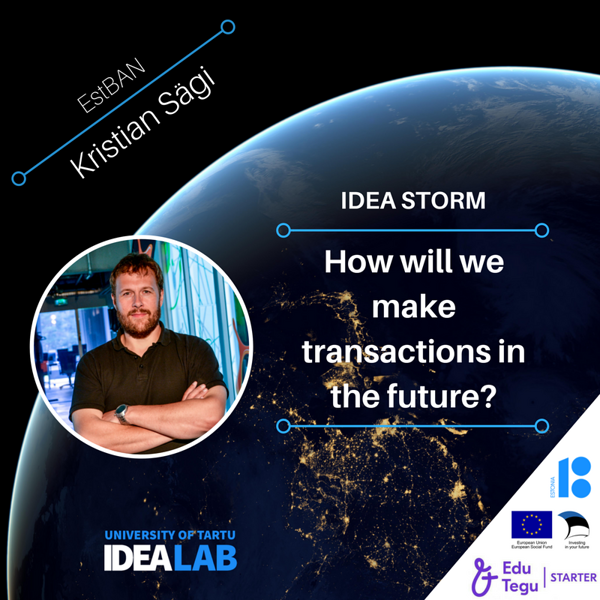 Sign up for Idea Storm and let's generate new ideas together!